"How Can I Book You For A Live Gig?" Contact me by phone or through this website. Generally, if you ask me about a date and I have it open (assuming the conditions are agreeable), I will accept the gig. It's that simple. It is of utmost importance to me to NOT cancel a date once it has been booked, even if I get asked about something that pays more. Not everyone does this. As a result, I don't write tentative dates in my schedule. I need confirmation of a date in order to book it. If you need me to contract other players for an event, I will need a deposit to confirm the date. I have done this on numerous occasions with numerous styles of music--jazz, rock, folk, blues, bluegrass, classical, cajun, whatever. "Do You Have A Studio In Which To Record?" 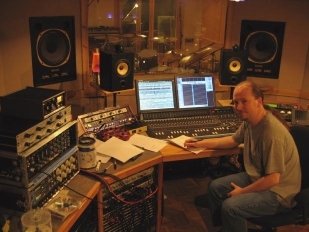 Many people get confused by the concept of a freelance recording engineer. As a freelancer, I don't have a studio of my own, but I have access to several choices of studios, depending on the needs of a particular project. I have recorded in large commercial studios, small commercial studios, churches, theatres, clubs, and even people's houses. Being in this type of situation provides flexibility in cost, location, and technical needs. "I Have A Home Studio. How Could You Help Me?" During recording, I can provide a useful ear and the ability to assess problems, should they arise. This can mean easier or more effective musician setup, more flexible sounds to the recording medium, better translation of sounds from the control room to other listening environments, and recommendation for any improvements or adjustments to your own setup, should you desire them. I have, on numerous occasions, mixed projects in commercial recording facilities that were recorded in people's homes or at other facilites. The artists for whom I have done this have enjoyed it in terms of not having to burden themselves with the technical aspects of mixing, learning what they did during tracking that helped ensure a more flexible mix, and learning what they could do in the future to improve their art. Any of this can allow you to concentrate on playing your material and not worrying about the multitude of technical issues involved in making a recording. "Do You Do Mixing And Mastering?" I have mixed numerous projects that were recorded by someone else that include home recordings by the artists themselves, live location recordings, and projects recorded at other commercial facilities. I usually prefer to mix in a commercial recording facility, as the results tend to be more predictable and the flexibility of equipment in most commercial facilities allows for a more efficient mix with more potential options. While mixing is generally an artful extension of the recording process (combining all the sounds into one dedicated, listenable format), mastering is the last step in ensuring that the one formatted representation translates well into the manufacturing process. While I understand the mastering process, I feel that it is best-suited to recommend mastering specialists for most projects-- people who go to work each day and concentrate on mastering records. I have had numerous pleasant experiences with many talented people in this area of work and would be happy to recommend them to anyone interested. "Do You Do Any 'Mail-Order' Sessions?" In this very interesting period of global communication, it is easier now than it ever has been for a wider variety of artists to collaborate across the globe. I have been asked on occasion to record drums and/or percussion for people located in different areas. The most common examples for me have been singer-songwriters with home recording setups or access to studios in their area that have asked me to play drums on their project here in North Carolina. They usually send me CDRs or DVD-Rs of some sort of guide track and some descriptive notes about what they want and I will try to give that to them and then send it back for their approval. It has worked out very well for a variety of artists and it's something that I generally enjoy doing. While my rates as an individual are very competitive, the overall rates vary depending on the budget and location of the project. Certain situations allow for more flexibility. This is a set of options that self-contained commercial studios generally can't offer. Contact me and I'd be happy to discuss your specific needs. The more information you can provide about what you want to accomplish, the more specific I can be in determining what will work for you. Flexibility is an important benefit of hiring a freelancer. "What Are Your Strengths In The Studio?" If you check out the comments clients have made about working with me, you'll get a good idea of what I'm about. I don't like to dictate the pace or artistic direction of a particular project. I prefer to let the artist decide and communicate to me what they would like done. I like to think that many people come back to me because they are happy with how I translate their ideas into a listenable medium. "Do You Have Instruments Or Gear Available For Musicians?" Yes, especially when it comes to drums. If I know in advance what is requested, I'll be happy to provide it at no additional cost (with the exception of drumsticks, new drumheads, guitar strings, or picks). While I do have an oddball assortment of amps, pedals, keyboards, etc., I am not in the business of providing keyboards or samplers for creating songs from scratch. "Can You Recommend Other Musicians For a Project?" Yes. Being a frequently performing musician in a variety of situations, I know MANY musicians who can perform in a number of different genres. I know many, many instrumentalists and singers who can provide talents in classical, jazz, rock, country, bluegrass, R&B, gospel, and many types of ethnic and folk styles. If you need an arranger for a project (for horns, strings, etc. ), I know several excellent ones, as well. "Do You Run Live Sound?" While I certainly understand live sound systems and have consulted a number of churches, clubs, and bands on their PA system setup, I generally don't run live sound. I am, however, more than happy to give a good recommendation to a number of very well-qualified people in this area. Feel free to contact me by email or by phone at 704-488-1790 if you have any additional questions or concerns.